Solar powered heaters are the best option for pool heating systems. Installation of the solar pool heating systems results to a cut down in electricity costs. This is due to the fact that the swimming pool consumes more power to have it heated. These systems, solar, require minimal operation and maintenance costs compared to the electric powered systems. What are the major features of solar pool heating systems? Solar collector: this is the device that ensures circulation of water which then is heated by the sun through radiation. 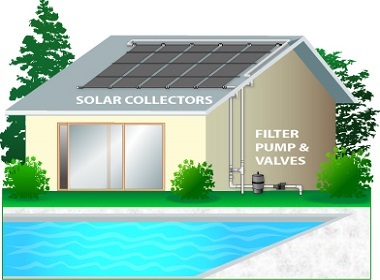 Filter: its major work is to separate debris from the water which is to be pumped to the solar collector. This makes sure that the collector doesn’t block from time to time. Pump: its function is to pump water from the pool to the collector and then back to the pool. It makes the circulation cycle of water to and from the pool complete. Control valve: whose function is to control the flow of water through the solar collector and back to the pool. From the pool, water is passed through the filtration process to remove the unwanted materials and then pumped to the solar collector. The solar collector panel then receives heat through radiation from the sun which heats the pool water. After the heating process, the water is then pumped back to the pool. The solar collector when supplied with water during the night performs the cooling process and water is pumped back to the swimming pool. This function is beneficial to the regions that experience hot climate or even during the summer. Water in the solar collector with higher temperatures than that in the pool is diverted to the swimming pool through the sensors and valves. The valves can be either automatic or manual. On the other hand, water with temperatures same as the pool water won’t go through the solar collector. These are solar collectors that lack a glass cover. Heavy duty rubber or UV treated plastic are the materials used to manufacture these panels. The materials enhances the general durability of the solar collectors. The unglazed collectors are cheaper due to the simple designs and parts. These collectors are effective since they can be used by both indoor and outdoor pools even though some little modifications are required. This is the costly type of collector. Made from copper tubing and a plate of aluminum, it improves its expensiveness. The covering glass is always made from the iron-tempered materials explaining the higher cost of the glazed solar collectors. The main benefit of these types of collectors is their ability to capture heat in an efficient manner in comparison to the unglazed solar collector systems. In return, the demand for glazed collector systems has increased especially in areas that experience cold climate. With this property, these systems can operate all year round through different whether conditions. Note: It is recommended that you have a freeze protection included on both glazed and unglazed collector systems especially if they are operating in colder weather conditions. Site evaluation: This is highly required before making any move. Through site evaluation, you will be able to know the amount of solar energy that reaches the place you intend to have solar collector installed. You site should have solar resource that is adequate. You can involve a local expert to analyze the site and advise accordingly. The required system size: the size of the solar powered pool heater depends highly on the size of the swimming pool, the regional temperatures and the collector efficiency among other factors. The solar collector surface area should always fall between 50% and 100% of the total surface are of the swimming pool. You can always increase or decrease the collector area ration to the pool surface area using a pool cover. It however depends on the climatic condition of the area you stay. The angle of orientation of the collector: You need to mount the solar collectors anywhere close to the swimming pool. Mounting on the roofs is the most recommended place due to the wide exposure and easier tilt angle of the panel towards the sun. The tilt and orientation angles have a direct effect on the proper functioning of the solar powered pool heater. It is one of the factors that the analyst should never ignore when doing a site evaluation. Efficiency of the system: For proper installation of solar pool heating system, a qualified solar expert should perform the operation. Proper installation will mean that the system runs as it is required thus ensuring that maximum efficiency is achieved. Proper maintenance should be ensured so as to have the system reach its optimum and also increase its lifespan. The cost comparisons: You need to compare the prices of different solar heating systems keeping in mind your budget plan. This will make sure that you choose a system within your financial abilities. The comparison also ensures that you get the best deal at a better price. The rules and regulations that govern solar heater systems: Each government usually have regulations and standards that govern the quality of products available to the citizens. Make sure that you choose a solar pool heating system that is accredited by the required quality and assurance bodies. It is one of numerous ways used to prove quality of products available on market. In conclusion, you need to carry out detailed research based on the above factors before making the final decision to acquire the system. With proper system in place, you will enjoy its services for quite some time with minimal operational costs. Solar power is one of the very many environmental friendly source of energy.